Here, we provide you a list of top 10 programming languages which are going to be a hotcake in 2019. This analysis is based on industry's trend and demand, and the research which our team has done. Note: We are not arguing that any specific language is objectively better than another and vice versa. It is up to you to choose according to your interest and learning potential. Some languages may take longer time to learn and lengthy while some may have tiny syllabus and easier to learn. We also believe that a professional programmer must learn more than one language. Python is one of the fastest growing programming languages and it is getting popular day by day. Python is used to create web applications, desktop applications, network servers, machine learning, media tools and more. There are a lot of online resources to learn Python. You can follow Code Academy, JavaTpoint, Python official documentation, Google's Python Class eBook etc. to learn Python. Python is mostly used for back-end services and API's. If you are in security or Site Reliability Engineering, Python is the best choice to learn. Now, Python is providing a lot of web development framework like Django, Pyramid and Turbo Gear which make it a hot choice. Python is a very good choice for beginner developers, as it is a high-level, general-purpose programming language. Some people can argue over the inclusion of java in the top 3 popular programming languages. But, we have a lot of evidences to include it here. Java is the ruling programming language for the last 20 years and believe me it is not going anywhere in the upcoming years also. Currently, there are a lot of projects running in java and its object-oriented features and robustness make it irreplaceable. Surely, it will be in the list of top 10 programming languages for years. If you are an absolute beginner, then JavaTpoint is the best platform to learn Java. You can also refer some online video platforms and developer's community like stack overflow when you get comfortable with it. There are a lot of features and incredible flexibility makes java all time beginners' favorite. Java along with Android is used around 90% of fortune 500 companies for making variety of backend applications. 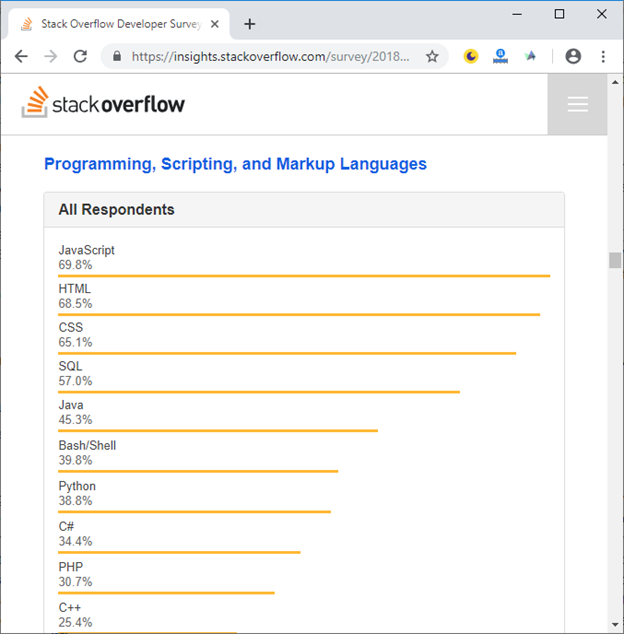 You can see the Java popularity stats according to Stack Overflow's survey for 2018. Rust is a new system-level programming language. 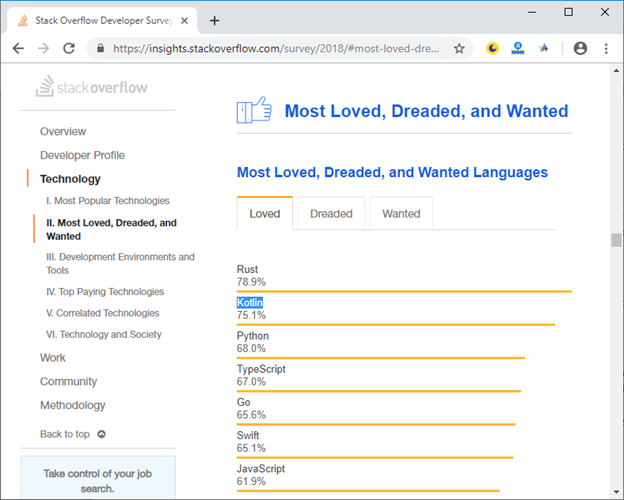 If you haven't heard about this language then, you will surprise to see that it is the most loved programming language and came first place in the 2018 Stack Overflow's Developer survey for developer most loved and wanted language list. There are a lot of online resources to learn Rust. You can follow Code Academy, JavaTpoint, Rust official documentation https://doc.rust-lang.org/book/ etc. to learn Rust. You can see that Rust is the most loved programming language of 2018 by Stack Overflow Developer survey. Soon, it is going to be very popular thus demand of Rust professionals will surely increase. You can see the Rust stats as the most popular language according to Stack Overflow's survey for 2018. Go is a minimal programming language developed by Google. It is going popular in python developer's community as it is very similar to Python. It is simple to write as Python but more efficient as C++. Python provides better features to write concurrent programs. There are a lot of online resources to learn Go. You can follow JavaTpoint, Udemy, Go official documentation https://golang.org/ etc. to learn Go. It is good for beginners to start with Go because it combines the best aspects of functional and object-oriented programming. It provides a valuable set of inbuilt development tools. Some good and famous projects are using it, for example, kubernetes and Ethereum Cryptozoic Project are based on Go. You can see the Go stats as the most loved language according to Stack Overflow's survey for 2018. The beginners who want to go in iOS development field, they must choose Swift as a high-paid career path. It is relatively new programming language developed by Apple for iOS and macOS development. There are a lot of online resources to learn Swift. You can follow Udemy, Code Academy, JavaTpoint, Swift official documentation, etc. to learn Swift. Swift is the best option for beginners who wants to move in the field of iOS and macOS development. This language is also in the list of most loved language by Stack overflow survey. Besides this, it is developed and used by Apple which is undoubtedly one of the best organizations to work. In the list of most loved programming language issued by Stack overflow, Kotlin is the second most loved and wanted programming language in 2018. There are a lot of online resources to learn Kotlin. You can follow JavaTpoint, Udemy, Kotlin official documentation, etc. to learn Kotlin. If you want to make your career in Java and Android development, Kotlin is the best option to learn. It is fully inter-operable with Java and comes with no limitations. It is now used and loved by Android developer. In 2017, Google announced that, Kotlin is now the official language for Android development. Kotlin works great with all existing Java libraries and frameworks and gives the best performance. You can see the Kotlin stats as the second most popular language according to Stack Overflow's survey for 2018. There are a lot of online resources to learn TypeScript. You can follow Udemy, JavaTpoint, TypeScript official documentation etc. to learn. Doesn't matter how much time has been passed, C++ is remained in high demand due to high performance, reliability, and variety of contexts you can use it in. There are a lot of online resources to learn C++. You can follow JavaTpoint, Udemy, C++ official documentation, etc. to learn C++. C++ is an old language but you know that "old is gold", C++ is always in high demand due to its high performance, reliability, and variety of contexts you can use it in. Its most popular projects are Microsoft Windows, Google Chrome, Amazon's website etc. F# is designed and developed by Microsoft. It is mainly used in data analysis, scientific research, data statistical, game designing and artificial application etc. There are a lot of online resources to learn F#. You can follow JavaTpoint, Udemy video tutorial, F# official documentation, etc. to learn F#. 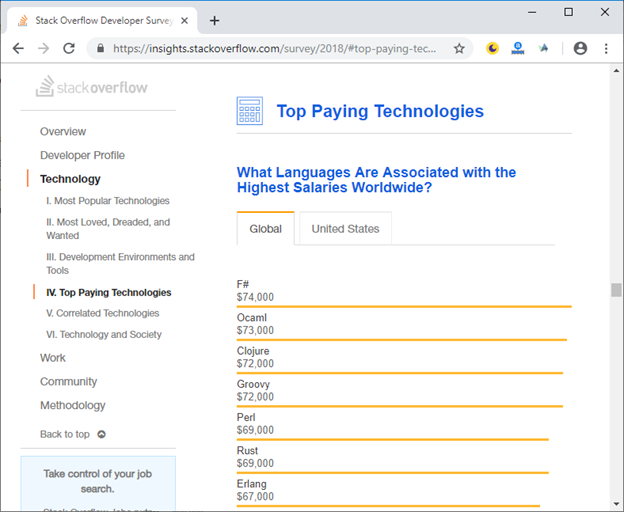 According to the latest survey of stack overflow, F# is emerged as the top paying technology. 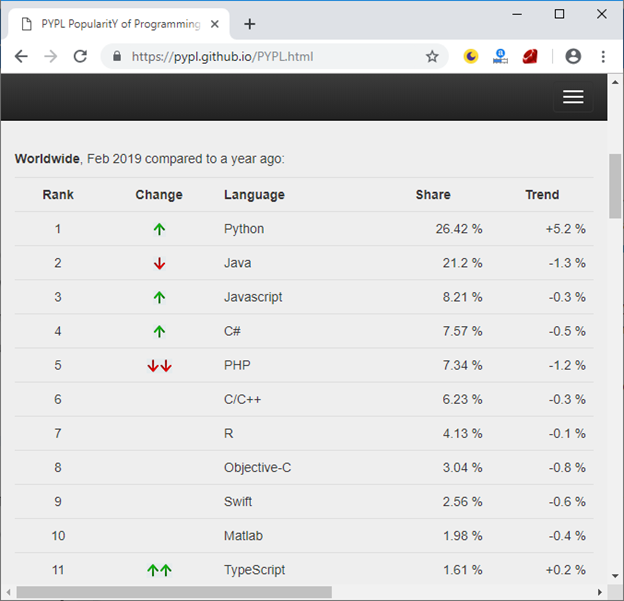 It is getting popular day by day and soon, it will be a top rated programming language. This was the list of top ten programming languages you should consider learning in 2019 for a better career prospective.